WELCOME to the R1b-L513 and Subclades project! L513 is a very stable mutation of the Y chromosome that gets passed down father to son through the generations. It probably occurred first in a man about 3500 years ago, our founding father. Synonyms for L513 are DF1 and S215. Synonyms just different names for the same SNP. However, the additional SNPs CTS5396, Z249, Z250, S5191, S5194 and S5197 are equivalents that mark the same haplogroup we call R1b-L513. This descendant chart shows the branching (subclades) from our founder that we've identified so far through SNP testing. Are these families descended from ancient Gauls, Gaels, Menapi Belgium Celts, medieval Normans and their Flemish or Breton allies, Hiberno-Vikings or Brythonic Celts? or all of these? Are they from old Britain, Northern France, Benelux, the Scottish Borders or Welsh Marches? Which surnames were part of various Medieval Age clans? What tribes were in during the times Julius Caesar invaded Great Britain? 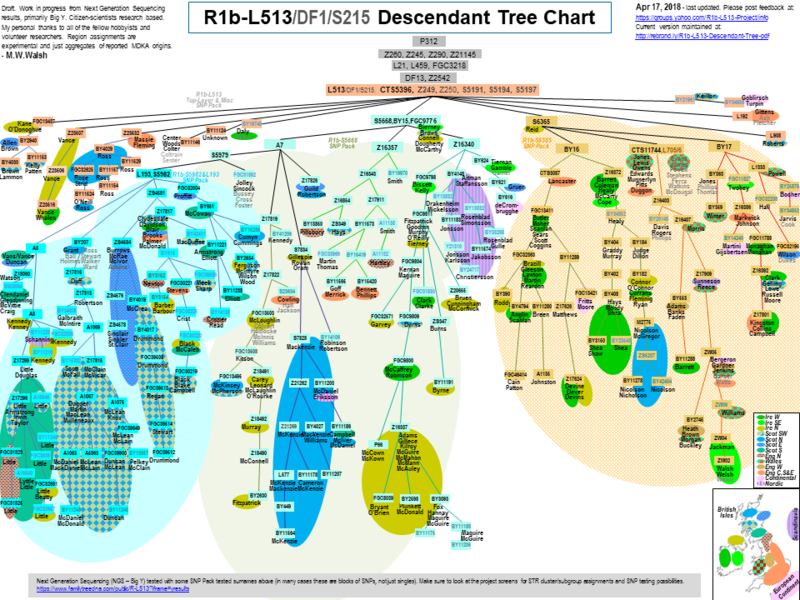 What about the Norse subclades of R1b-L513? The answers are probably different by branch until we get back towards our founder, but these are the kinds of questions we want to answer. 1. You must have a Y test result with Family Tree DNA (FTDNA). For frequently asked questions and answers about Y DNA testing check the ABOUT/FAQ item in the menu above. All members must order Y STRs or they will not appear on the project reports and in the Y matching system. 2. To join this project click on JOIN in the graphic banner at the top of this page and login with your FTDNA account kit number and password. 3. Update your FTDNA account by going to MANAGE PERSONAL INFORMATION. This is critical to finding potential relatives and origins. We must share data to be successful. I recommend using the tested person's last name as the Contact Last Name. If the kit owner is different than the tester, please use the First Name field to include "c/o" and the kit owner's full name (for mailing purposes). 3A. Go to PRIVACY & SHARING to check the below settings or you will not be a part of analyses. 3B. Go to PROJECT PREFERENCES to check Advanced or Limited Access for the project administrators. We can't help you if not granted at least Limited Access. Don't forget to check the box for future administrators too. 3C. Go to GENEALOGY to update your Paternal Ancestor. Enter only information that is not speculative. Example: “James Welch, b.c.1812, Co. Kilkenny, Ireland”. Enter your COUNTRY or leave blank if you don't know. Do not enter "U.S." unless truly of Native American paternal lineage. Please try to be specific if UNITED KINGDOM; pick either ENGLAND, IRELAND, NORTHERN IRELAND, SCOTLAND or WALES. Use current country borders so use NORTHERN IRELAND if accurate even if the ancestor predated its formation. Update the map location. 3D. Go to ACCOUNT INFORMATION to check your Contact information. Please add a backup email address and a beneficiary. Talk to your beneficiary. d) and going all the way to 111 Y STRs supports family tree building when you reach brick walls in your genealogy, since the 111 STR panel is estimated to have a change once every three generations. 6. Move forward with an Single-Nucleotide Polymorphism (SNP) testing plan so your subclade can be identified and haplogroup updated. Evaluating matches at 67 or 111 STRs can be very helpful. Clear patterns or STR signatures among your best matches may help you decide what SNPs or SNP Packs to buy. This project's Activity Feed as well as the R1b-DF27-Project yahoo group are setup to help you evaluate testing plans. Even if you don't have matches on myFTDNA, the projects R1b-GOLD_Haplotypes spreadsheet can be helpful in identifying signature STRs for more efficient SNP testing. SNPs can be ordered one at a time from FTDNA from your account, selecting the blue UPGRADES button and then scrolling down to the ADVANCED TESTS box and the BUY NOW button. 6B. The L513 SNP Packs are cost effective options that gives you very good coverage of the R1b-DF27. You can order SNP Packs from your FTDNA account. If you don't see the option, please check the blue UPGRADES button, then the BUY NOW button in the ADVANCED TESTS box, and pick SNP PACK in the SELECT A PRODUCT box. Please post on the R1b-L513-project yahoo group if you have questions. If you have a true interest in genetic genealogy and breaking beyond the brickwalls of your genealogical records, please strongly consider both Big Y to determine your haplogroup down to a very recent timeframe and 111 STRs so that you can refine your close-in family and surname mutation history tree. The project administrators are volunteers and do not represent the vendors nor receive special benefits. This is a public project. The more of us who test and share our information, the more we will all know. When you join you're making surname, ancestor and DNA related results public, from which they can never be fully retracted. Please remove yourself if you don't want to share publicly. We do not publish your full given name or contact info. Research information is shared across the R1b All Subclades project and major R1b Subclades projects. This is a Y DNA haplogroup project. Actively participating involves Y SNP testing. SNP testing at FTDNA is required to be assigned to a subgrouping. This project is operated as a system of record project. It is intended to operate for posterity purposes. Our descendants and family members and distant cousins can continue on when we are not able to or have new focuses in life. New generations can build upon our work. Subgroupings are done by SNP validated testing with a chain of evidence to the test results. Surnames and STR based predictions are not used to assigned subgroupings. Please validate findings with FTDNA testing so the project reports and analysis will reflect that. Outside research is fine, but please test at least your most youthful (terminal) haplogroup SNP at FTDNA. Single-Nucleotide Polymorphisms (SNPs) are critical for R1b people as they are very stable, rarely mutating. R1b is both a very large group and relatively young. Most European R1b paternal lineages are related within the last several thousand years. That means that R1b STR based haplotypes often look alike. The most common pattern of Y STRs is the Western Atlantic Modal Haplotype (WAMH). Most R1b people match several components of it. It is just a remnant of the fact we are closely related. SNPs help differentiate the branches of R1b’s descendants tree. A high level simplified version is on this project's ABOUT/OVERVIEW web page. R1b-L513 itself, the main branch of our tree, is marked by the SNP L513. We all are L513+ since it was present in our common ancestor, a single prehistoric man. There are now thousands of known branches on the R1b tree. Many of these branches have coincidentally matching Y STRs. In other words, their branches appear to cross. This gives us false matches.This is definitely a problem with limited haplotypes of 37 or less STRs. 67 is really the bare minimum in most cases and 111 is the new standard. There are now 2,000-6,000 L513 people with 111 STRs in FTDNA's database. STRs are very useful for general guidance and for matching at the very recent family level, but they are not 100% reliable since some mutate relatively quickly and go both up and down and back to where they started from. SNPs are much more reliable markers for our paternal lineages. Theoretically, they are permanent throughout eternity so they reliably show our branching of paternal lineages. The number of SNPs available for testing is growing as more and more advanced testing is developed. You will want to identify your terminal SNP, which is the youngest SNP mutation on the haplotree. Your youthful SNPs are the most important genetic genealogy. d) benefit all R1b people in general, as well as science, because we'll have a better understanding of how and when this lineage of men spread across Europe as rapidly and as dominantly as it did. Why DNA testing at a full platform genetic genealogy company? Why Y STRs and how are they used? Why Y SNPs and how are they used? Why Big Y Next Generation Sequencing? What should I do with my Big Y results? Should I upgrade Y STRs, even if I have limited or no matches? What are terminal SNPs? novel SNPs? private and public SNPs?